Cult Cabernets, Cliquish Chardonnays, Rhone Rangers, and Sinful Zins... the wine lover’s palate is always looking for something new to grab hold of and embrace. Recently, I became aware of Sagrantino while looking for an out-of-the-way vacation spot in Italy. Sagrantino is an indigenous red wine grape from Umbria. It has been used in the production of local wines for hundreds, no, thousands of years. Why were large conglomerates beginning to buy up local wineries? The more information I found about Sagrantino, the more curious I became and, when I discovered that the Sagrantino Wine Festival, (Settimana Enoligica - Wine Week), coincided with our travel plans I decided that I had to find out what the fuss is all about. The access point for the beginning of our introduction to the wines of the Sagrantino grape was the ancient hill town of Montefalco (known as the balcony of Umbria). Mary and I are seasoned travelers, having covered Italy from the northern lake country to Sicily. We know Roma, Firenze, Venice and Tuscany but we were not prepared for the rustic beauty of the Umbrian countryside or the elegance of our home for the duration of the festival. We were staying at Villa Pambuffetti, just outside the walls of Montefalco and, before I continue our Sangrantino Saga, I must say a few words about the Villa Pambuffetti. “Squisito, bello, perfezionare.” To have found such an oasis of style and hospitality in the midst of the rural setting of Montefalco was quite a revelation. 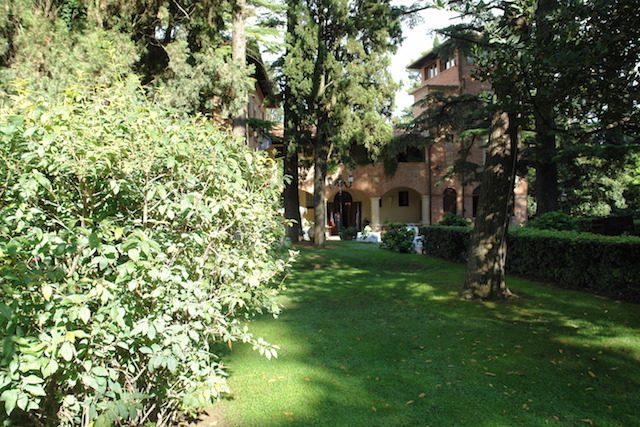 The Villa is set in the middle of a lush park. The 19th century structure rises from the surrounding green and is capped with a typical Umbrian tower (our first night was spent in the tower room and we awoke to views of the mist rising from the verdant valley below). The rooms are modern and convenient yet you feel like you are in another time where the pace is much slower and more elegant. There is a lovely veranda for alfresco dining, as well as a formal dining salon. At night you are treated to an aperitif under the stars with live piano jazz drifting through the clean, clear air. The kitchen, overseen by Alessandra Angelucci Pambuffetti (chef, author, owner and taskmaster) prepares sophisticated fare served by a gracious wait staff. The Sommelier, suggests, decants and serves us a bottle of Montefalco Rosso from Rocca di Fabbri, a blend of Sagrantino, Sangiovese and Merlot (Sagrantino’s little brother). Are we really in the Umbria countryside? Dinner is a delight. But, I digress. We came to Montefalco to learn about Sagrantino! Importer friends with connections in Umbria kindly set up meetings for us in Montefalco, the first of which was with the Cecchi winery. 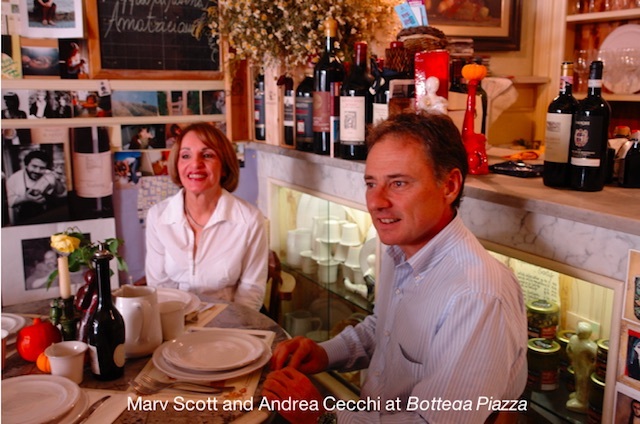 For over a hundred years, the Cecchi family has been producing and selling quality wines from Tuscany. The actual wine making happens on three separate estates in the most famous production areas of Tuscany and, now, Umbria. We were told that a winery representative would meet us at the Villa the next morning . Much to our surprise, the representative was Andrea Cecchi himself, along with Giulia Dirindell. We struck up an immediate, friendly relationship and set off for lunch at one of Andrea’s favorite restaurants in the town of Bevagna, a few miles away. The restaurant, Bottega Piazza Onofri, is very hip with a decidedly contemporary feel. The walls are lined with wines, artwork and unusual sculptures by a Brazilian artist. Mary is fascinated by them and buys one. Cool jazz by Miles Davis is drifting through the air as platters of antipasto are served and Cecchi wines are opened. We are tasting Tuscan varieties. First a crisp, bright Vernaccia di San Gimignano, followed by a Chianti Classico Reserva and capped off with a rich Val Della Rose Morellino di Scansano from the Maremma in Southern Tuscany, served with our pasta Amatriciana. The wine is ruby with a garnet core. Dry, elegant, stylish and well structured. Smooth tannins frame the striking dark fruit and mineral-laden finish. We finish lunch and Andrea insists we go back to Montefalco for a vertical tasting of their “Uno” a 100% Sagrantino from their Umbrian estate, Tenuta Alzatura, located in the Sagrantino di Montefalco Docg production zone. Uno is the result of the Cecchi family’s promotional project, put into place several years ago. The wine is dry on the palate, with a strong structural body derived from 14 months of aging in small oak barrels (barriques). Due to its full-bodied structure, Uno, like most other Sagrantinos is ideally served with highly flavored meat dishes and mature cheeses. We taste multiple vintages. The younger wines have a strong tannin load in the mouth. As we progress to older vintages, the tannin takes on a velvety softness and hints of blackberries, plums, vanilla, leather and coffee come to the forefront. At this point, we must take a break because tonight is the opening gourmet dinner for Sagrantino Wine Week. The dinner is to be held, luckily, at Villa Pambuffetti and will feature a menu prepared by guest chef Marco Bistarelli from Ristorante “Il Postale” in Citta di Castello. Evening descends on the villa and we dress for an alfresco dinner. Music waifs through the night air as we walk to the covered pavilion. Andrea and Giulia invite us to sit with them, the mayor and other dignitaries. After what seems like an eternity, the first course is served - duck breast with figs and foie gras accompanied by a steely Grechetto. The game is on! Next comes ravioli of potatoes and mushrooms with a spicy sauce made from a reduction of ox tail. It is perfect with the Montefalco Rosso from Antonelli. The parade of tuxedoed servers continues with a loin of slow cooked pork in a reduction of Sagrantino (after all, it is Sagrantino Wine Week). Now, we are into selections of Sagrantino di Montefalco from a variety of producers. The richness of the pork paired with the intensity of the just released Sagrantinos works well. What could be next? A dessert of roasted plums and gelato with a reduction of Sagrantino passito (the indigenous sweet wine made from dried Sagrantino grapes). Naturally, we are served passito with the dessert. It makes a fitting ending to an over indulgent day. Settimana Enoligica - Wine Week has officially opened... Montefalco is abuzz with Sagrantino producers, farmers, Sagrantino aficionados, artists, filmmakers and a mix of curious tourists. The exhibition and tasting hall next to an ancient church on the main street of Montefalco is packed. Over 30 local producers are showing off their just released vintage of Sagrantino di Montefalco as well as Montefalco Rosso, Grechetto and Passitos. Our senses are overloaded as we walk it off, strolling back to Villa Pambuffetti for a rest and a light dinner. Revived, we sit under the stars and make a major decision. “Let’s just split a pasta and a salad.” The choice is perfect, we are relaxed and contemplating the soft comfort of our bed when Mouro, Allessandra Pambuffetti’s husband comes by and insists that we have to meet his friend, Giampaolo Tabarrini. Giampaolo drives up a few minutes later and we are introduced. He is the driving force behind a family winery. He is engaging and very enthusiastic. He will pick us up tomorrow and take us to his winery. The next morning, we are roaring down tiny vineyard roads. Giampaolo talks non-stop on his cell phone while gesturing with his other hand. Who’s driving? He is young, bright and excited about giving a new life to his grandfather’s winery. We arrive at a new modern structure that is, surprisingly, built on high technology. He even has his own computerized weather station that can signal critical changes that effect vineyard activity and sensors that keep the aging room at a specific temperature. That may be well and good but, how are his wines? We taste multiple vintages and, as you may expect, the older the wine, the softer it is on the palate and the more the complexity lingers in the mouth. Papa bolts from the room and soon returns with a special pecorino cheese made by a local shepard and aged in a wrap of lard and ashes. Giampaolo opens a jar of his mother’s apricot jam. We dab it on the cheese and take a bite, followed by a sip of Sagrantino... marvelous. Mama Tabarrini joins us and we all walk to the vineyard to view the grapes. Harvesting will begin in a week or so and the cycle of grape to wine will begin again, bringing with it hope and expectations for another stellar vintage. We have come to Umbria and have been seduced by beauty, history, kindness and, of course, Sagrantino di Montefalco. 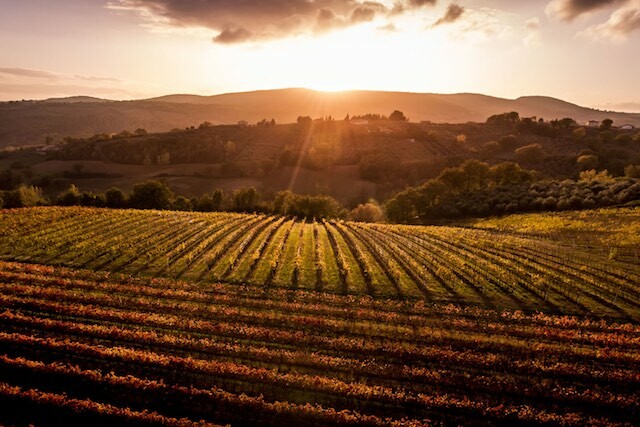 It remains to be seen whether Sagrantino will be the next big thing to hit the international wine market but, for those who travel La Strada Del Sagrantino and taste the Umbrian experience, it will remain a very special wine.